In keeping with urban areas throughout the world, New Zealand’s cities were established next to streams, rivers, lakes and harbours. As well as water supply, these waterways provided for transport, trade and recreation. Paradoxically, however, there is substantial evidence that urban development is harming these very same waterbodies. Parts of Auckland’s harbours, for instance, suffer from increased rates of sedimentation, toxic metal accumulation, reduced ecological health and a growing unsuitability for recreation [PDF]. These effects are at least partly due to discharges of urban stormwater. A stormwater treatment pond, Auckland’s North-western Motorway (J. Moores). Until the late 20th century stormwater management focused on drainage and flood control and stormwater was piped and discharged to the nearest waterway with no treatment. Stormwater was considered to be chemically benign, like rainfall. Now we know that stormwater can contain sediments, heavy metals, hydrocarbons, nutrients and pathogens. As a result, urban councils have started managing stormwater for quality, as well as for quantity, effects. 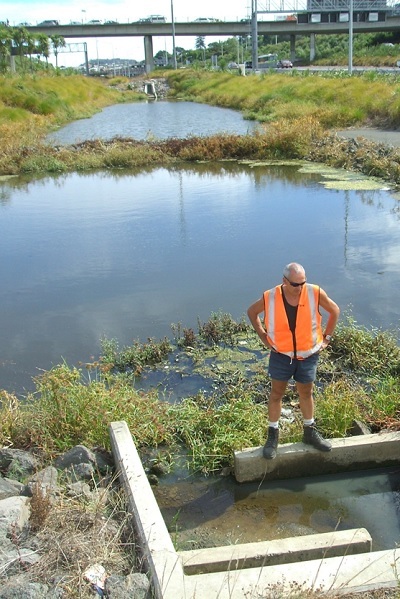 Councils have installed (and required others to install) stormwater treatment devices, such as ponds and wetlands. New concepts, such as Water Sensitive Urban Design (WSUD), have emerged, where contaminant generation is limited by reducing the footprint of urban development and stormwater treatment is integrated into the landscape using biofiltration devices such as raingardens and swales. 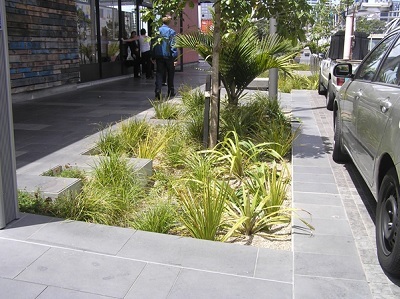 A raingarden in Auckland’s Wynyard Quarter (S. Harper). Despite this progress, managing stormwater quality effectively remains a difficult business, not only because of the cost and complications in retrofitting treatment within already developed catchments, but also because of the physical and chemical characteristics of stormwater contaminants. Zinc and copper, for instance, are present in stormwater in both dissolved forms and particulate forms (attached to sediment particles). Typically, stormwater treatment works through deposition or filtration of sediments, so it is less effective where metals are predominantly in dissolved forms. To complicate matters further, sediment particles in stormwater are highly variable in size. Metals such as zinc and copper are often disproportionately associated with finer particles. Unfortunately, these finer particles are the hardest to filter and the slowest to settle, meaning that many treatment devices will struggle to remove the metals. While technologies targeted at removing fine particulate and dissolved contaminants have become available in recent years, it’s clear that for treatment to be effective stormwater managers need to know the quality of their stormwater. Stormwater quality can be challenging to measure because discharges are intermittent and there can be hundreds of discharge points in a catchment. Contaminant concentrations can vary by up to two orders of magnitude during a storm, often with highest concentrations at the start (the ‘first flush’). When sampling, it’s easy to miss these peak concentrations. 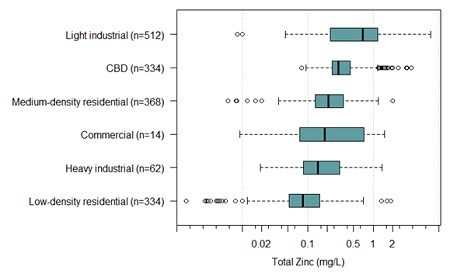 Variation in total zinc concentrations in stormwater, by landuse. Because of these challenges, literature data are often used as a proxy for site-specific monitoring. In order to try and make the most of existing data, NIWA is developing a webtool that collates and summarises urban runoff quality data collected throughout New Zealand. These data show a wide variation in stormwater quality, with differences reflecting the influence of land use, regional characteristics and stormwater treatment. The wide variations in stormwater quality and lack of long-term monitoring make it difficult to assess changes over time. However, we do know that there have been some improvements: removal of lead from petrol in the 1980s resulted in a marked reduction in lead concentrations in stormwater, and consequently in urban streams and estuaries [PDF]; and in some locations urban stream quality has improved by ending discharges of untreated industrial stormwater. But for other contaminants, the sources still exist (for example zinc on roofs), or are even increasing (for instance copper emissions from NZ’s growing vehicle fleet). And a whole range of new ‘emerging contaminants’ such as pharmaceuticals have been detected in stormwater and urban waterways. As well as facing these new challenges, it’s also important to recognise that stormwater management is part of a bigger water quality picture. In mixed landuse catchments, environmental managers are challenged to understand the relative impact of intermittent urban stormwater discharges compared to other sources of pollution, such as wastewater discharges and agricultural runoff. Building this understanding will become an increasingly important part of catchment management in New Zealand’s new ‘limit-setting’ policy environment. Jonathan Moores is a hydrologist and Jenni Gadd an aquatic chemist at NIWA.